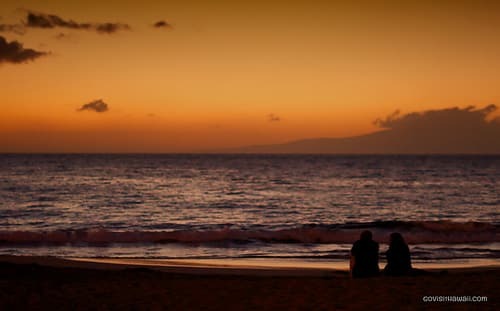 After a bit of a break in our Hawaii honeymoon series, we pick back up with a look at what makes Maui a great place for romantics to visit. What’s unique or special about Maui for honeymoons? Maui is the island that many say is no ka oi – the Hawaiian phrase meaning the best. In fact, there’s a Maui magazine with that very title. Many travel publications often rate Maui as the best US island vacation destination. Maui offers it’s own unique beauty to explore. The island is lined with many beautiful beaches. A lush rainforest dotted with waterfalls fills the east side. Standing at over 10,000 feet above sea level, the summit of Haleakala offers an amazing view of a romantic, star-filled sky followed by an unforgettable sunrise over a crater. Of course, we can’t forget the royal blue ocean surrounding Maui. The underwater world offers a whole new layer of beauty with many great snorkeling spots. If your romantic trip to Maui happens to occur between January and March (and usually through April) , you’ll have the opportunity to see the magnificent humpback whales as they visit the island to breed and give birth – a romantic trip of their own. Though the whales visit all the Hawaiian islands, the majority gather between Maui, Molokai and Lanai. Excellent snorkeling – Snorkeling side by side is a romantic way to check out the colorful tropical fish. A catamaran cruise to Molokini crater takes you to one of Hawaii’s most famous snorkeling spots, but there are other great spots that are accessible directly from the shore. Sunset sails are always romantic. Go to a luau to try local food and a colorful Polynesian dancing show. Maui has some great luaus. You can compare Maui luaus here. Tour the road to Hana where you’ll see beautiful rainforest and coastal scenery. Plus, you’ll have a chance to swim at a waterfall or at a red and/or black sand beaches. Stargaze and watch for shooting stars before watching a magical sunrise at Haleakala crater. You and your sweetie will surely want to snuggle up to keep warm at more than 10,000 feet above sea level. See our Maui vacation itinerary with details of how enjoy all of Maui’s major attractions. 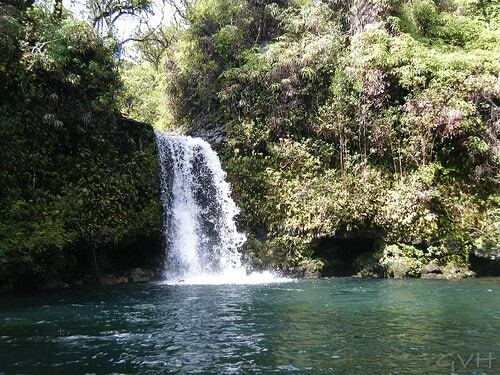 A secluded waterfall-fed swimming hole off the road to Hana. Where to stay on your Maui honeymoon? The major resort areas are in West Maui and South Maui, though there is one top-rated resort in Hana in East Maui. The following map shows how each of those areas are defined. The popular Maui beach resorts are in West and South Maui. There, you’ll find mostly four and five-star hotels, with a few three-star hotels and a number of vacation condominium/villa resorts. Three resort areas that we think make a great base for a Maui honeymoon are Kapalua and Kaanapali in West Maui and Wailea in South Maui. In each of those resorts areas, you’ll find a good selection of restaurants and shops that are within walking (or shuttle) distance – which makes for lovely evening strolls on tiki torch lined paths. Travaasa Hana on East Maui offers one of Hawaii’s very few all-inclusive-ish options. Read our Travaasa Hana review for more details about this resort. Hana is what many say is like Hawaii used to be. It’s a small, friendly town. Instead of stop lights and busy roads, you’ll find quiet roads nestled in a tropical rainforest. For a more budget-friendly Maui honeymoon, consider staying in a condo. 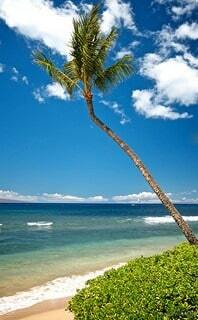 You can find several nice condo resorts in West Maui and around Kihei on South Maui. 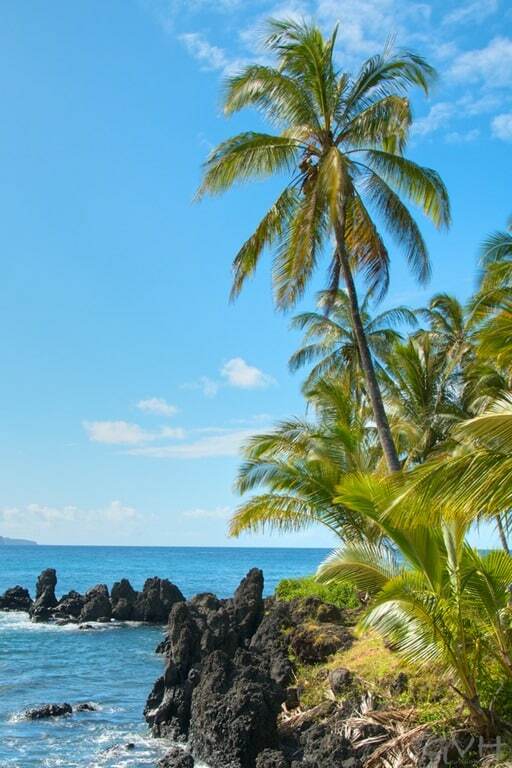 Stay in one of the West or South Maui resort areas the majority of your honeymoon with a night or two or longer in Hana, which will give you more time to explore the sights along the road to Hana. See our article on how to enjoy two separate vacations on the same island. 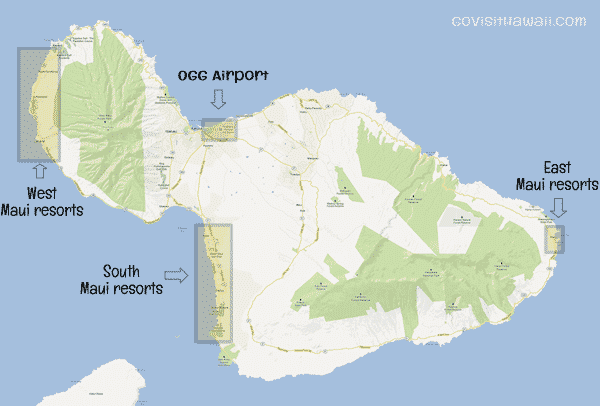 The Maui airport OGG has become a secondary hub for Hawaii plus Lanai and Molokai are only a ferry ride away. So, it’s fairly easy to hop over to another Hawaiian island for a day of fun exploration. If you do split your stay, we highly recommend that you stay in the least fancy hotel first. It’s much more pleasant to upgrade through your stay rather than downgrade. Another consideration to factor into your choice of where to stay is finding a hotel that has an adults-only pool for serenity. Here’s our article listing all the Hawaii hotels with adults-only pools. In each of Maui’s major resort areas, you’ll find romantic ocean front or ocean view restaurants. The West and South Maui ocean front and ocean view restaurants offer fantastic sunset views. See our Maui restaurant recommendations for more dining advice. One extremely memorable dinner that we highly recommend you plan is a sunset picnic on an Maui beach. You may find that you have the beach to yourself for a very romantic sunset picnic. How much money will a Maui honeymoon cost? Use our Hawaii vacation budget calculator to help you estimate how much you’ll need to budget. Are there any cautions for someone considering a Maui honeymoon? We don’t hesitate to recommend Maui as a honeymoon destination, however, we should mention that Maui’s average hotel cost is the highest compared to the other Hawaiian islands. For example, in a recent weekly report, Maui’s average room rate was a $278 per night, while other other islands were averaging $241 or less per night. Check out our Maui vacation guide for more specific Maui trip planning details. Our customizable, one-week Maui itinerary makes honeymoon planning easy. Also review our popular first-time guide to Hawaii vacation planning. Yes,I agree! Maui is the most beautiful and romantic island and well suited for honeymooners. But, as you mentioned here it might be expensive to have your honeymoon there. However, we usually willing to spend this money for our honeymoon, so we can have the best experiences and memories. Great suggestions, Sheila and breathtaking photos! I’ve decided to go to Maui! I have a plane booked for Tuesday and we are going to fly into OGG and be on the West side of the island. I’m not going for a honeymoon but I’m sure it will be fund regardless! I have seen a 5 or 6 foot shark while snorkeling and it didn’t even seem to pay us any attention. My soon to be husband and I will be in Maui for our honeymoon in April and I am wondering if you have any recommendations on lei greeting companies? I know that they won’t be right there at the plane but I think it would be a fun start to our honeymoon.